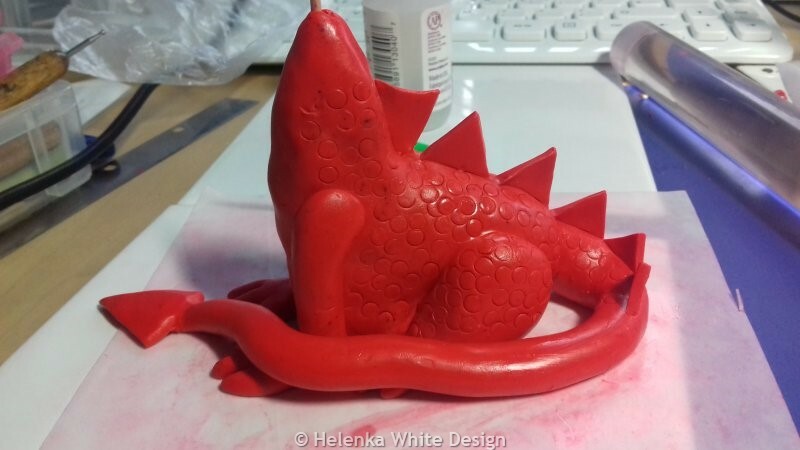 In this post I am sharing with you how made my dragons. 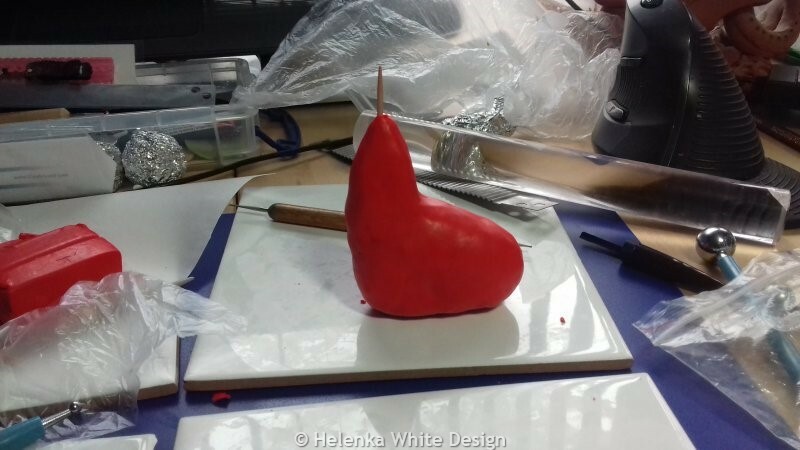 Last year I decided to take part in a competition run by the British Polymer Clay Guild. The theme was celebration. You had to fill in a form explaining your entry and provide a few images – and pay £5 per entry. 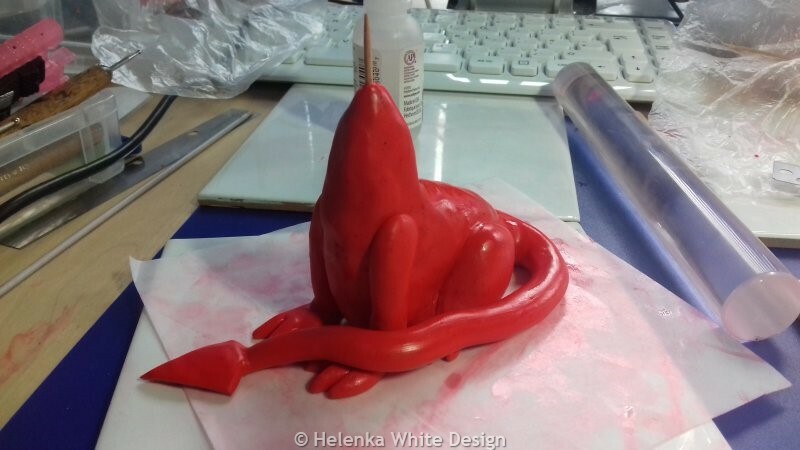 I decided to make a dragon, because I never really made one (I created one after a tutorial for a friend, but that’s not the same as coming up with your own design). 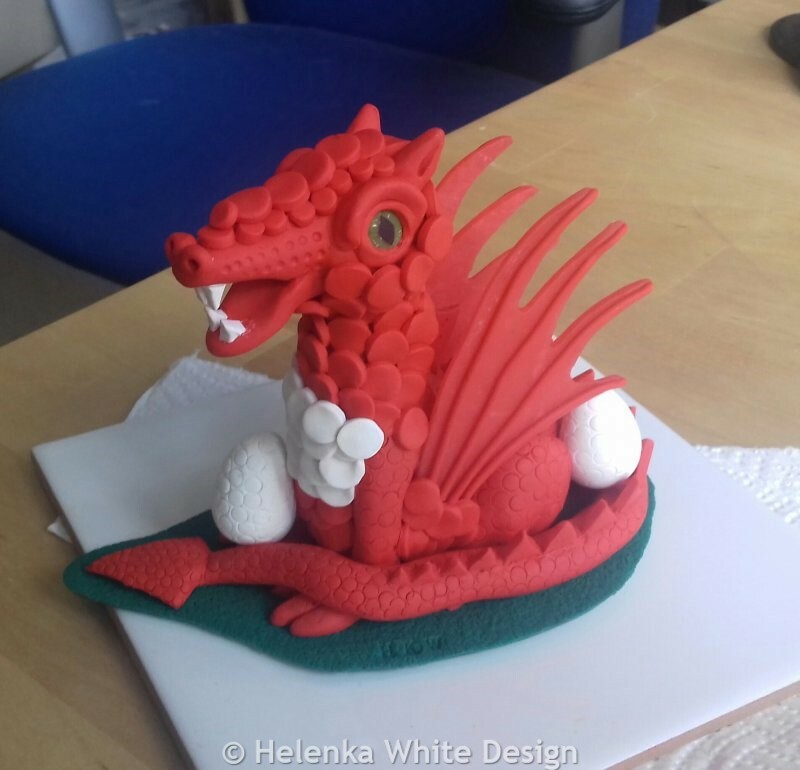 I live in Wales and so it made sense to celebrate dragons. I therefore chose the Welsh colours red, green and white. 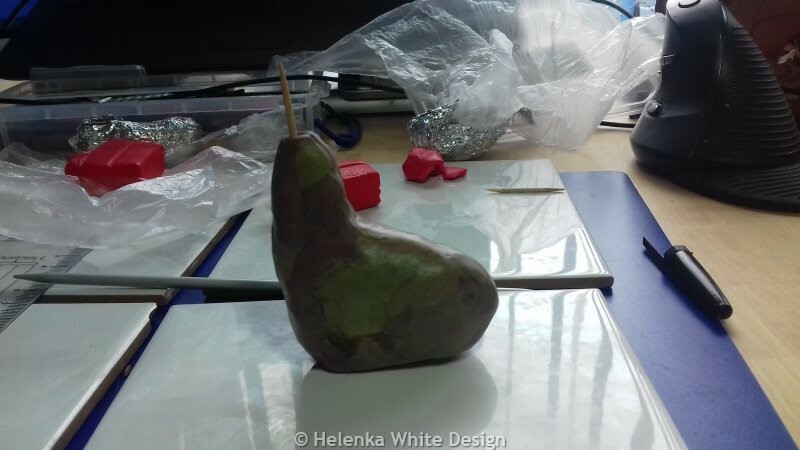 The result was the biggest sculpture I made so far with polymer clay. 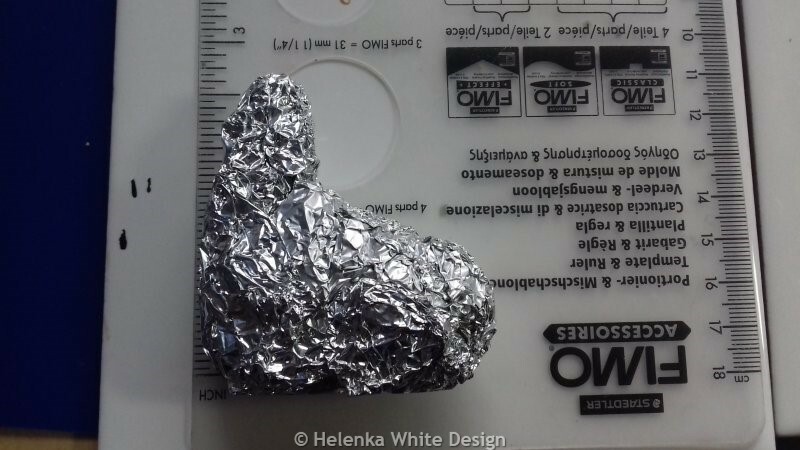 As with most of my polymer clay sculptures I first started with the body and used an armature for it which was made with scrunched up aluminium foil. Armature for the dragon’s body. Armature with first layer of polymer clay. 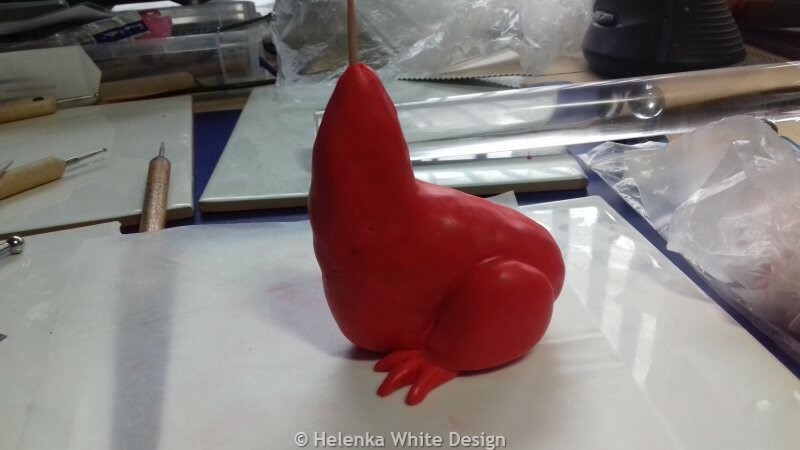 Armature covered with red clay. I used a tiny circle cutter for the scales and cut out triangular shapes for the spikes. Dragon with back legs attached. Dragon body with tail- adding the spikes. 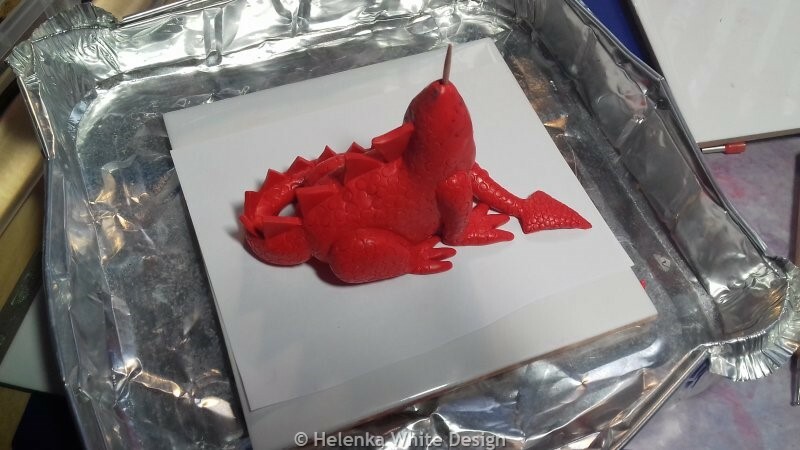 Dragon – ready for the first bake. Next, I had to figure out how to make the wings – and it was a lot of trial and error. I first drew a template on carton in several sizes to figure out how big the wings should be to fit with the body. I baked the body first. 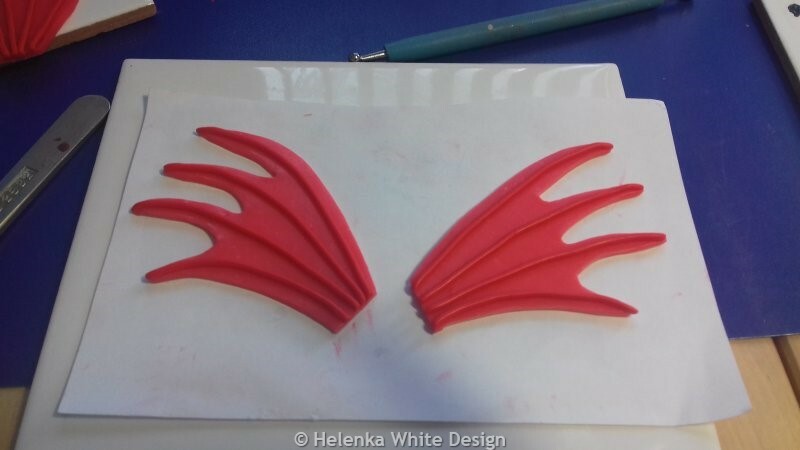 I created my wings with translucent clay with red mixed in and the vains were extruded. My first attempt was to just attach the raw wings to the baked body – and of course it went wrong. The wings were bending while they were in the oven, so I rescued the whole thing and decided to bake new wings separately. First attempt at attaching the wings. 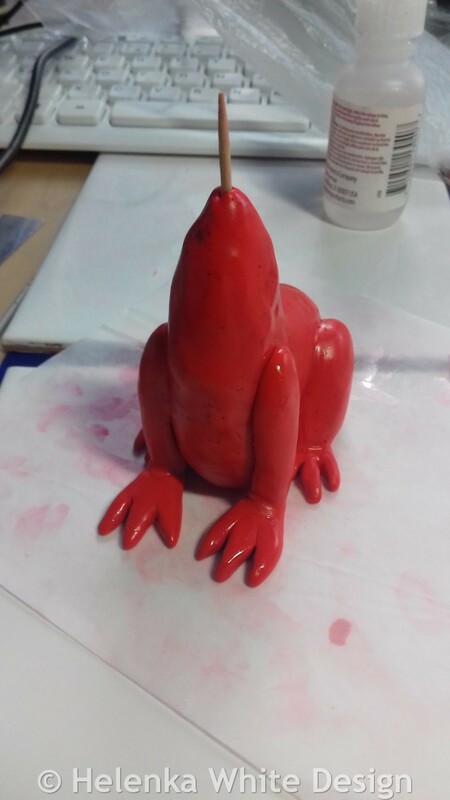 I then attached them with liquid clay to the body, added the green plinth and baked the dragon again. Dragon body with wings attached. Then I worked on the head and the neck and eggs. To cover up seams and the wings where they were glued on I cut out lots of circles (very time consuming!) 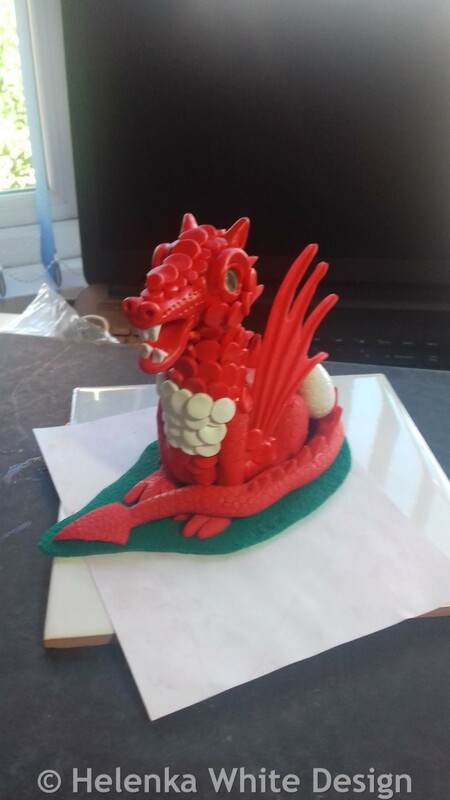 and then baked the whole dragon again. 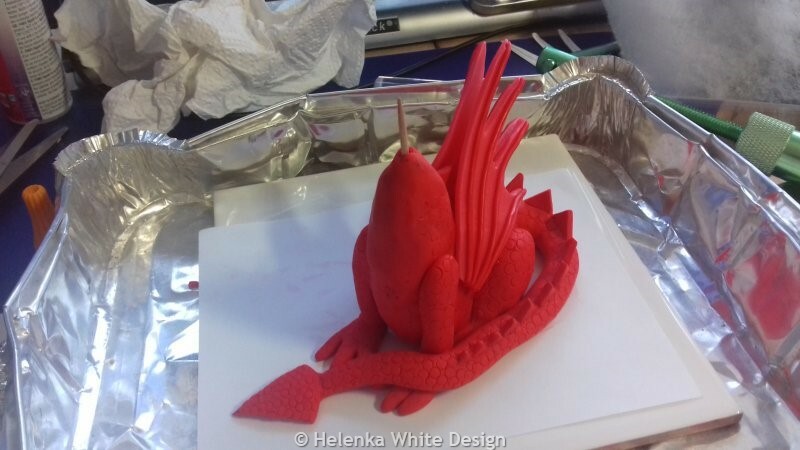 Dragon with dragon head and scales before the final bake. After the final bake I varnished the eyes. Sadly, I didn’t win in my category (emerging artist, sculpture), but my dragon got a lot of positive comments and as soon as I shared her on Facebook a friend wanted to buy her. I made the smaller version in purple for which I had to make new wing templates. 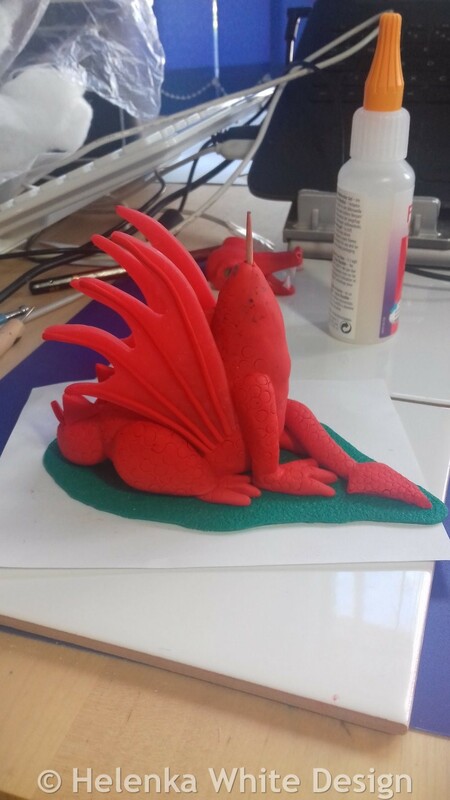 I didn’t use an armature for that dragon and I pinched the tail to create spikes. 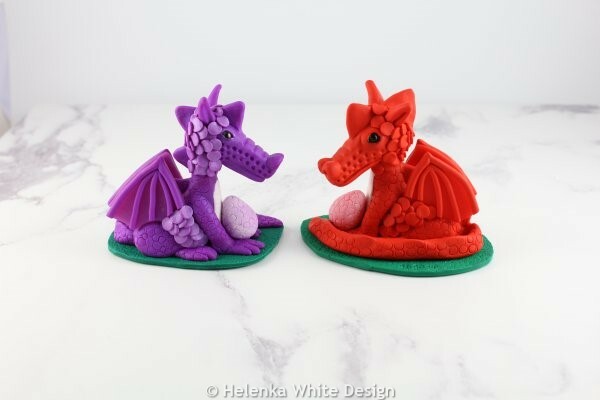 My friend loved the purple one too and in the end she bought both dragons as Christmas gifts for her brother and his girlfriend. 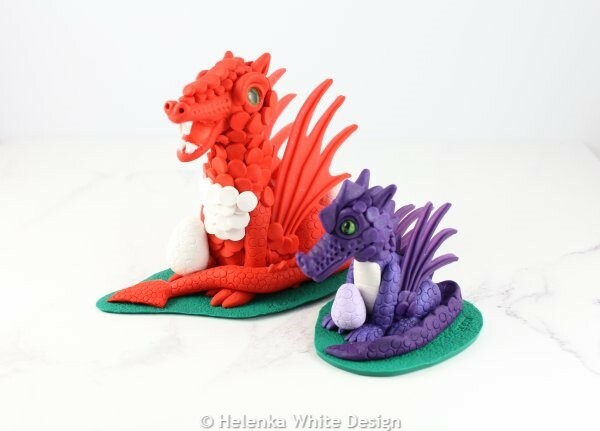 This was the first time I had to create my adoption certificates (which I offer with every sculpture) and she chose some appropriate names for both dragons. The red one was named Cariad and the purple one Seren. 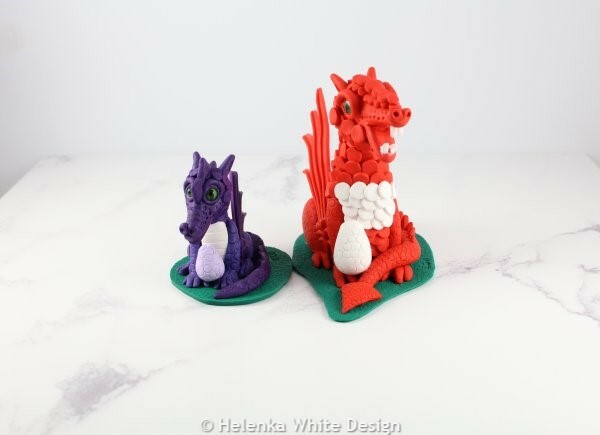 Since I have sold both dragons just before Christmas, I have sculpted new ones which you can find here. For those I changed the design of the wings as I found that cutting out the first template was extremely difficult and I decided to simplify the design a little. I am now happy with my new wing designs and kept the templates for future dragons. Thanks for reading. 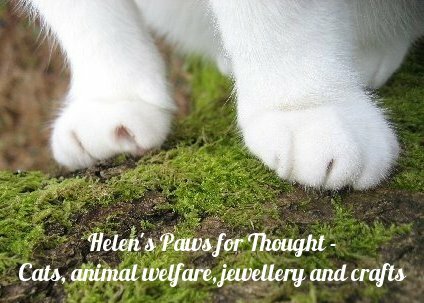 For updates of my work, make sure to subscribe to my newsletter here.